I really loved reading this article on Facebook. A friend of mine shared it and I just had to repost it. What an amazing husband to write this about his wife. He sees first hand what we all go through, and although we never went into this job for the money --- we are being criticized in the media that we are "underworked and overpaid". I know we all love what we do because of the children - BOTTOM LINE! It's just so disheartening when people try to break us down. You don't know until you know, and this husband KNOWS! It's so nice to have some people out there who understand and are willing to speak up about it. Thank you Vic DeSantis!!! I am a guy who lives for summers. I wasn’t always like this but I’m pretty sure I can pinpoint the exact time in my life where the months of June, July, and August became such an integral part of my happiness. You might be inclined to deduce that my yearning for these warmer times is related to a sports season or a passion for outdoor activities; perhaps even slower times at work. In some regards you might be correct but not exactly for the any one of the three multiple choice answers provided. You see, my wife is a teacher. When I met my wife she was not a teacher - she was a student. When we married she was finishing her degree and starting out on her own professional career. To say that I knew nothing about the educational system at that point would be an enormous understatement. In the nearly 20 years that followed I have learned everything that a parent, student, citizen, and spouse should know about the challenges that every teacher faces. Armed with those insights it is difficult to reconcile the carefully framed messages of politicians and privatized education proponents with the realities of life in the classroom. My wife is a teacher. I’ve never once, in the history of our life together, seen her trading derivatives, speculate in real estate, engage in subprime lending practices, or make exorbitant demands on her employer for an outrageous salary. It is perplexing to me that over the past few years she and her colleagues have, at least in the eyes of many, become public enemy number one. I suspect that a good portion of this misguided angst is directly related to the economic environment; something that she had absolutely no part in creating. Is she without fault? Absolutely not. I have over the years thought that she would have been much better off taking her well-earned college degree and her intelligence into the private sector and guiltlessly accumulated as much wealth and material possessions as possible. Sometimes you just can’t talk sense into these folks. My wife is a teacher. Instead of making money she decided to make a difference. My wife is a teacher. For nearly 2 years she worked diligently to achieve the prestigious designation as a nationally board certified teacher – a designation that came with a small annual bonus. After meeting her end of the bargain, the state pulled the funding. My wife is a teacher. She has worked for a decade and a half for far less money than her counterparts who are not public employees. She did this satisfied with the proposition that the pay was steady, a small retirement income certain, and the intangible satisfaction of steering the lives of children. My wife is a teacher. Her income is now in decline. As a reward for her faithful years of service our state has decided that she should give back 3% of her salary towards her retirement. After all they say “this is what folks in the private sector do.” Tack-on another 2% reduction for the expired payroll tax holiday and the hits just keep on coming. My wife is a teacher. Despite continuous assaults on her take-home pay, she shells out thousands of her own dollars for classroom supplies. She is impervious to the yearly barrage of administrative mandates established by politicians and so-called “educational experts” – she soldiers on. My wife is a teacher. She is reviled by certain segments of our society who labor under the belief that she is underworked and overpaid. One would think that after fifteen plus years in a professional where a four-year college degree is a minimum entry requirement that most would not begrudge her a $40,000 a year salary. And for those less inclined to the truth, her salary is adjusted to smaller twice-a-month paychecks to cover the summer months when school is not in session. My wife is a teacher. She is tasked with the enormous responsibility for the care and safety of your children. I’ll dispense with the lengthy analysis on this topic. Two words suffice – Newtown and Oklahoma. Someone please let me know the next time Lebron James throws his body between a child and the working end of an assault rifle and I will hold professional athletes in the same reverence I do teachers. My wife is a teacher. For nine months of every year our family lives in the metronomic cycle of early morning wake-ups and late evening lesson-planning. We revel in the plethora of candies and candles, gift-cards and gadgets that herald the arrival of the “Christmas Break,” and I observe with interest the emotion that a hand-written note from a 1st grader can bring at the end of a school year. My wife is a teacher. From August to May she had dedicated herself to the interests of her kids and her school. She has prepared and toiled, laughed and cried – and shared one hundred stories about the amazing kids that walk through her door each morning. She has left me wondering in awe how she does so much with - and for - so little. It is the summer now – my happy time comprised of the few short weeks that I do not have to share her. My wife is a teacher – she is also my hero. I promise to return her in August. So to all the teachers out there! You DESERVE your summer vacation - so go enjoy it!!!! Thank you for sharing this. Made me tear up. What a nice man to put it all in perspective. You're welcome! It's so nice to listen to someone who understands. I gives a little validation for all we put into it! Awww! Love this! It made me all teary-eyed! Thanks for sharing! This makes me realize the sacrifices our families make so we can work with children and do such important work. 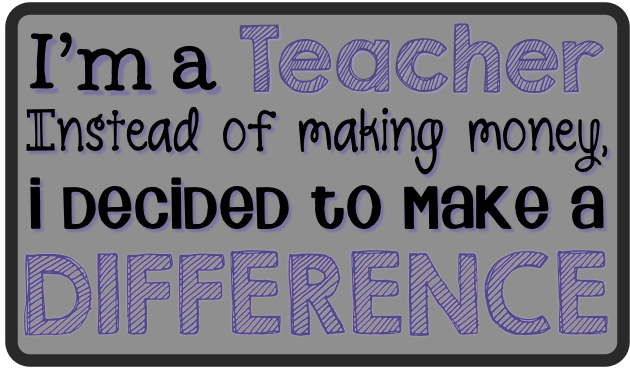 We do make a difference. Most of us can name our elementary school teachers straight up the grades. This reminds me that what I do takes up enormous time and energy but none of us would do any less. Right?